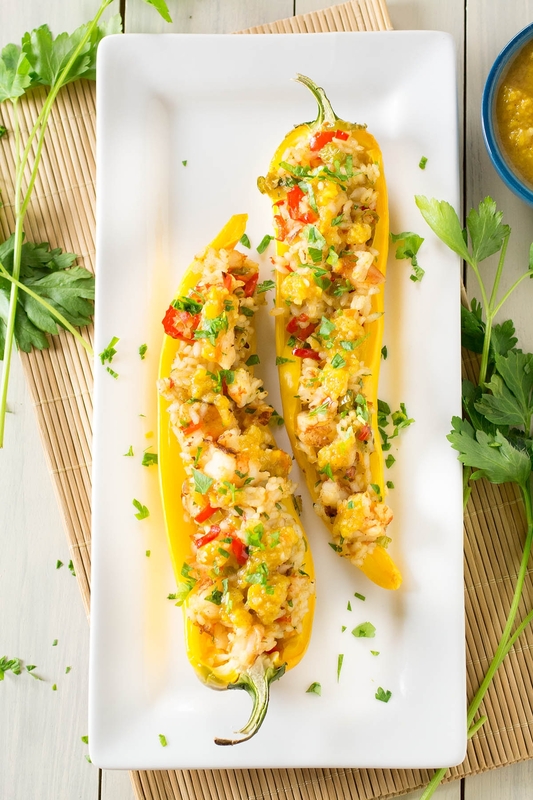 A recipe for large and vibrant sweet chili peppers stuffed with coconut rice, spicy chili-rubbed shrimp and Caribbean sauce with mango and habanero. Such a delicious meal. This is a recipe you’ll want to print up and bind into your favorites folder. You have one of those, right? A folder or a binder or somewhere that you keep all of your favorite go-to recipes? Here’s a new one! It’s time to bust out another stuffed pepper recipe, because I’m basically crazy for chili peppers – or should I say “mad”? 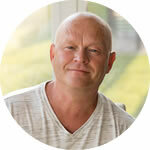 – and love to stuff them with all sorts of wild and delicious things. Like coconut rice! And seared shrimp! And Caribbean-style hot sauce! Drool. 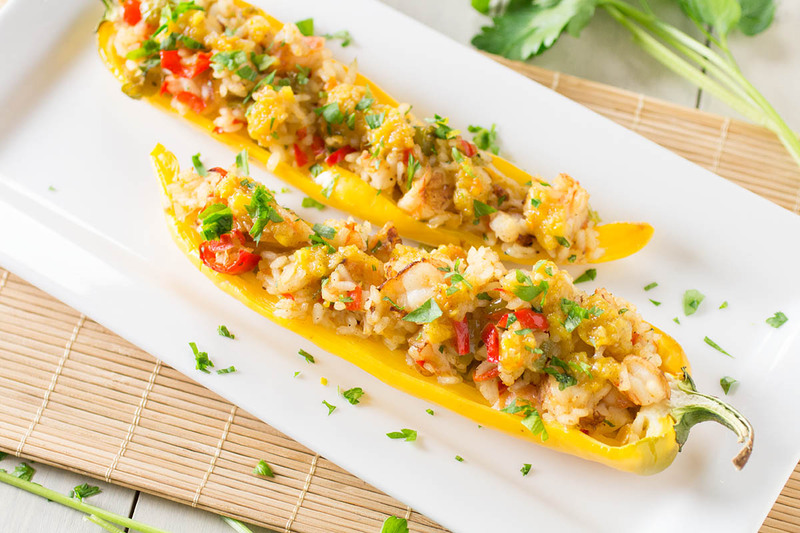 I pulled a couple Corno di Toro Gialla sweet peppers from our garden for this recipe, but you can use other sweet peppers you’re able to find. 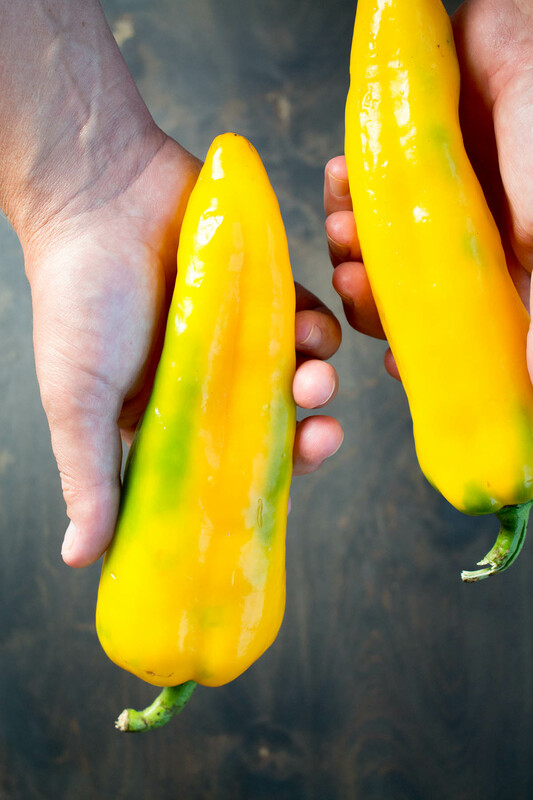 Get larger ones if you can, but if not, go with bright yellow, orange, or red bell peppers, which are usually pretty easy to get from the grocer. Just look at these babies. 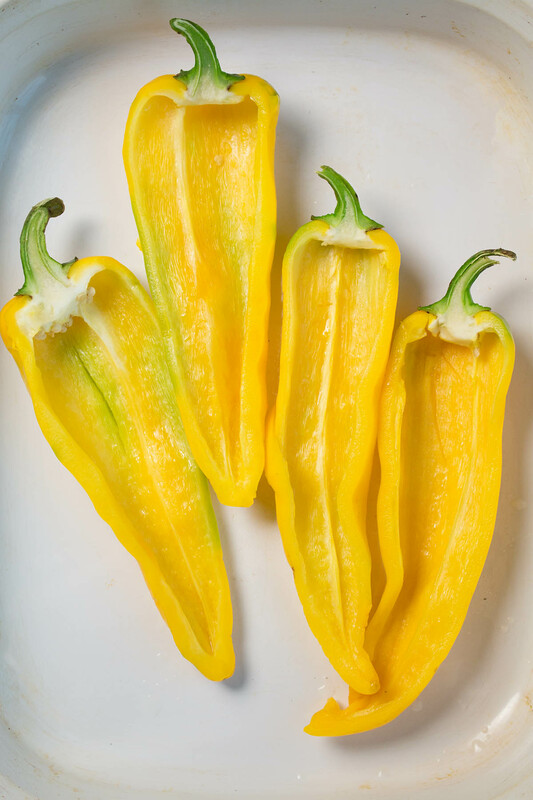 Learn more about the Corno di Toro Giallo pepper here. They’re long, thin skinned, thick walled beauties, so vibrant yellow and BEGGING to be stuffed. My peppers are speaking to me again. “Mike! Make us into food!” I shall oblige them. First, clean then slice up your peppers and core them out. Easy enough to start! Pop them into some boiling water a couple minutes to soften slightly. 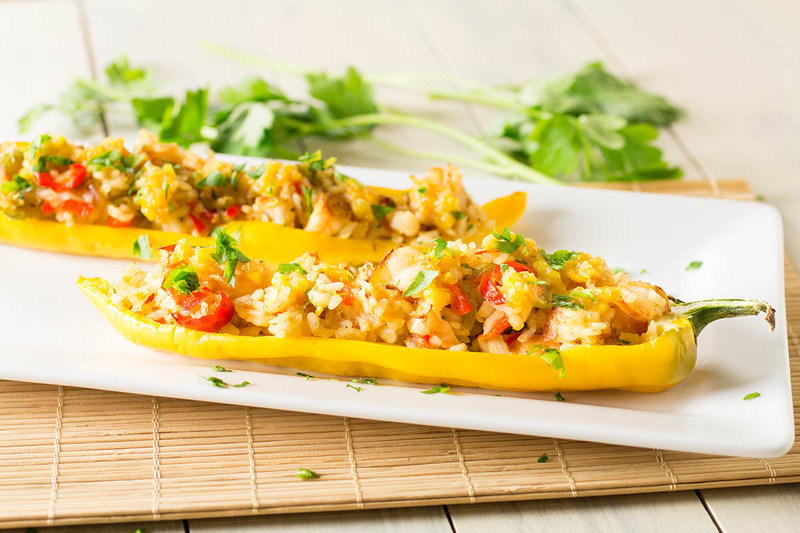 Set them into a large baking dish and set about to make your coconut rice, which you will infuse with a lot of flavor. Heat up a good sized pot and cook your spicier peppers in coconut oil until they are softened, then add your rice with water and simmer until the rice is nice and fluffy and coconut-y. When the rice is nearly done, season up the shrimp and sear them in a small pan. They don’t take long to cook at all. Use coconut oil for a bit more of that flavor. Chop them up, stir them into the rice with a few other fresh ingredients, including your Caribbean style hot sauce. You can use your favorite artisan blend, but if you’d like, make your own. 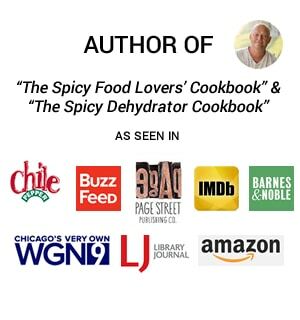 I used this recipe, one of my personal homemade favorites – Caribbean-Style Mango-Habanero Hot Sauce Recipe. Stuff the peppers and bake them at 350 degrees for 20 minutes, or until they are to your liking. Top them off with some garnish and extra hot sauce and you’re good to go! 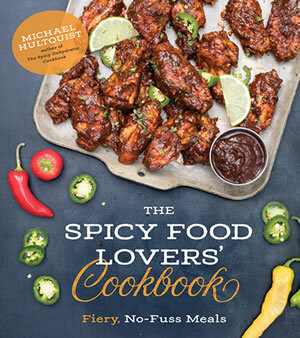 You’ll get all sorts of craveable spice and Caribbean flavor in each bite. Slice the medium sized peppers in half lengthwise and core them out. 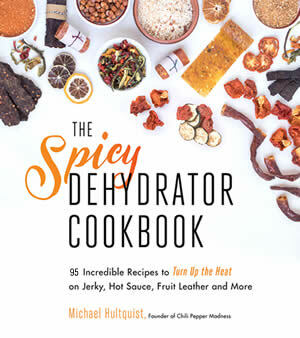 Bring a pot of water to boil and boil the peppers for 2 minutes to slightly soften. Drain and set the peppers onto a lightly oiled baking sheet. Heat another pot to medium heat and add 1 tablespoon coconut oil. Add spicy peppers and cook 4-5 minutes, stirring. Add rice and water. Bring to a boil then reduce heat and simmer until all the water is absorbed and rice is fluffy. If the rice is crunchy, add a bit more water and let is absorb. Remove from heat. Heat a pan to medium heat and add remaining coconut oil. 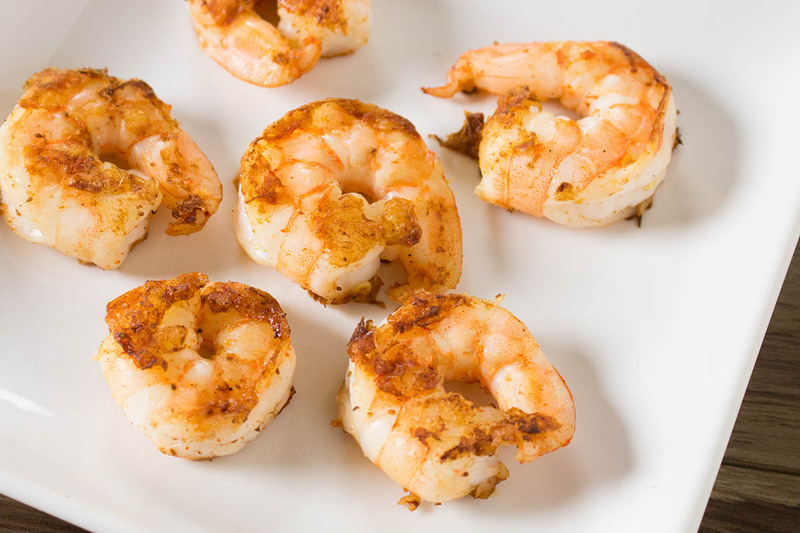 Season shrimp with chili powder, cumin, allspice and salt and pepper. Cook a couple minutes per side, until cooked through. Remove from heat and roughly chop. Add them to the rice. 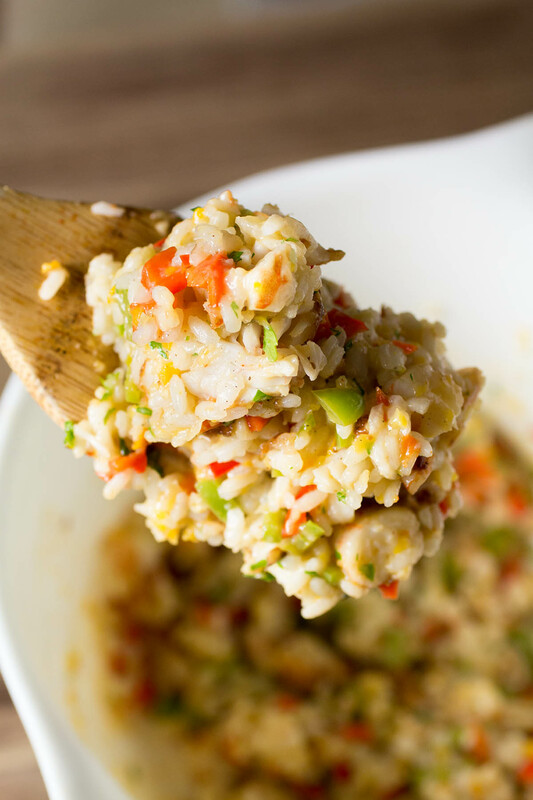 To the rice-shrimp mixture, add cilantro and a couple tablespoons or more of your Caribbean style hot sauce. Mix well. 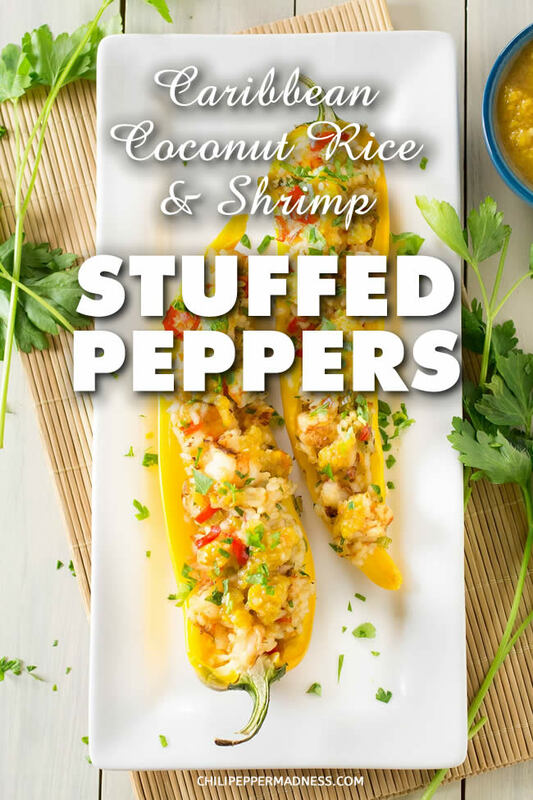 Stuff each pepper with your seasoned rice-shrimp mixture and bake for 20 minutes. Remove from heat and top with extra hot sauce and cilantro for garnish.